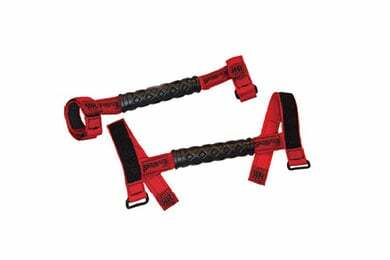 Skyjacker RRGH20-R - Skyjacker Rock Ready Grab Handles - FREE SHIPPING! Handles look great and look great on my JEEP. i like these because my jeep is red too. not a great value price wise, but well made and they look great. Exactly what you would expect. Get the smaller ones for the front bars that connect to the windshield and the larger size for the rear and main hoop. The quality and looks of the handles are great. The 3 inch handle could be used on a 4 inch bar (it has a lot of extra strap that doesnt velcro). Thats why it got a four and not a five. They are very handy, my kids love them. Reference # 763-532-620 © 2000-2019 AutoAnything, Inc.